Situated along the north shore of Clark Lake, Logan Creek is an undeveloped, isolated gem of Door County. The Wetland Kayak Tour is a peaceful paddle. You’ll kayak along Logan Creek, which is tucked away in the quiet side of the Peninsula. Its pristine waters are designated an Outstanding Water Resource. If you arrive early in the season, the banks of the creek are alight with the vivid yellows of the marsh marigolds and soft whites of the American starflower. The only noise you will hear along Logan Creek will be the wind through the forest, dominated by white cedars, white pine, black ash, yellow birch, balsam fir, and hemlock. Launch from our private location and within minutes the only sound you hear will be the occasional ovenbird, red-eyed vireo, black-throated green warbler, eastern wood-pewee, great crested flycatcher, rose-breasted grosbeak, and hermit thrush. A year-round habitat for waterfowl of all kinds as well. The paddle continues onto Clark Lake to the north shore of Whitefish Dunes State Park. Once on the Clark Lake, the Wetland Kayak Tour becomes more free form, as you will be able to explore as much as you desire, including the option to get out of the kayaks for a hike around the Dunes, or along the Ridges Sanctuary property. A truly unique tour. A hat, sunglasses, sunscreen, water, natural insect repellent, and a smile. The creek is spring fed and remains cool all year round, so a long sleeve shirt would be recommended for the first portion of the tour. Jeans are not advised. Check out our other kayak tours: Cave Point, Eagle Harbor, and Sunset Tour. Join us for a beautiful two-hour kayak tour along Door County’s pristine Lake Michigan coastline. The tour will take you along Cave Point County Park and Whitefish Dunes State Park. 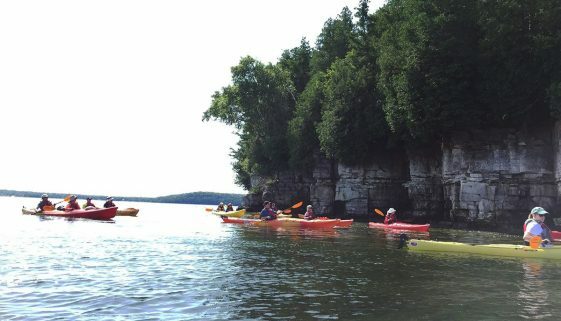 With the unique vantage point of your kayak, you’ll be able to experience the beauty of the caves and observe the beautiful karst landscape on crystal clear Lake Michigan. We’ll venture into a couple of the accessible caves at Cave Point, and spend a few minutes relaxing while enjoying the natural beauty and soaking up the sun, before kayaking back to the launch point at Schauer Park. The water is generally calmest in the morning, so it is best to book earlier in the day. The kayak seating area does tend to get a little wet so dress accordingly. Flip flops and water shoes are highly recommended, but you can also jump in bare foot! We also highly recommend shorts or leggings that you don’t mind getting wet (jeans are not recommended). The temperature does run cooler on Lake Michigan, so layers are good. On calm days there is ample opportunity to view the submerged caves all along the coast. The conditions are always subject to change, but as long as you arrive with a smile the trip will only brighten your day. You will want to dress appropriately for your Cave Point kayak tour, water shoes or flip flops are recommended. Swim trunks or wicking/tech clothing is recommended over jeans and cotton. Bring water, sunscreen, a hat, sunglasses, and some positive energy. We welcome GoPros, cameras, and cell phones with a proper case and lanyard – a great way to capture your experience. 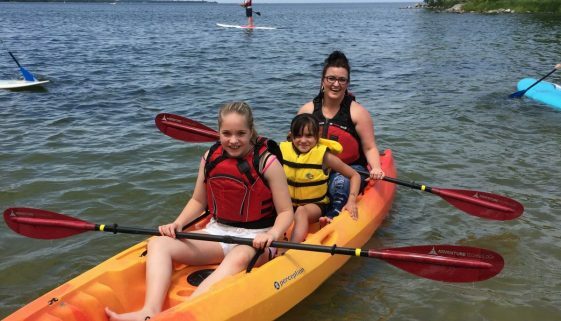 Check out our other Door County kayak tours, such as the Wetlands Tour, Eagle Harbor Tour, and Sunset Tour.